Yoohoo, snowflakes, this is what I was chatting about on Twitter the other day. 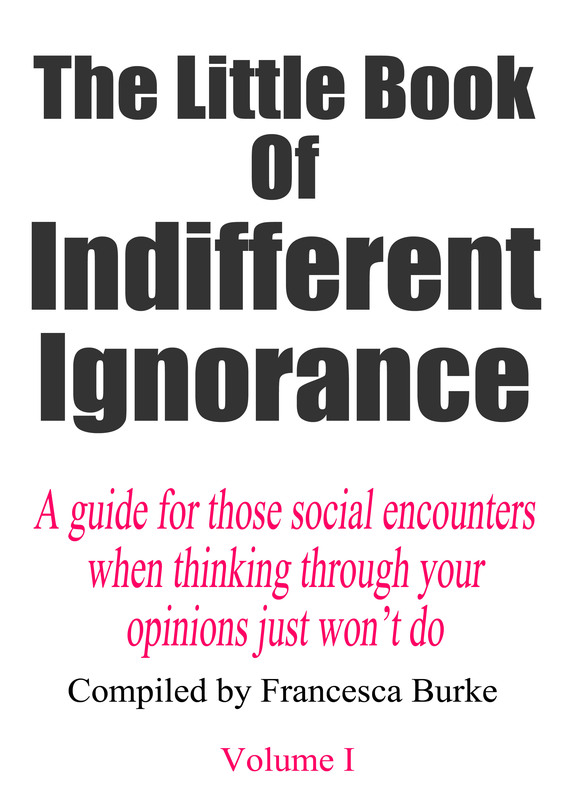 I am very pleased and excited to share my first book-of-sorts, The Little Book of Indifferent Ignorance, Volume I! Look, it’s a proper self-help guide! Big thank-yous to Ruby, who helped with design advice, and to tabloid-quoting racist homophobes, whose ideals informed this piece rather a lot. I do not currently have the resources for a proper book, as such, or a fancypants shop on this site, so the PDF is currently available to download; if you have a conscience, believe in compensating people for services rendered or enjoy reading the book, please make a contribution. Together we can tackle the disease of indifferent ignorance! That button will take you to my PayPal, where you can pay either through PayPal or with a card. Just enter ‘Indifferent Ignorance Book I’ or something in the description box so I know what it is you’re paying for; I will soon publish PDF booklets of my other work too. RRP for this particular book is £4.50 on Etsy, hint hint. This is part two of Five Ways To Celebrate Five Years of Blogging, by the way; you will be pleased to hear that the MCR merchandise reached its recipient, a lovely girl in Italy, successfully.